Photo 1. Mercedes-Benz Type O 6600 H "Omnibus"
From Latin, "Omnibus" can be translated to: "transport for all." The Mercedes-Benz Type O 6600 H (where O = Oelmotor = diesel and H = heck = rear = rear engine). 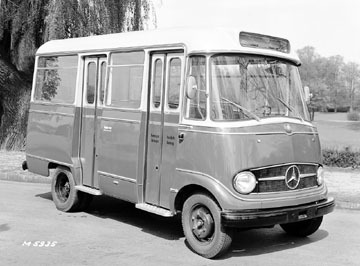 Mercedes-Benz produced its first independent bus design rather than one that took its cues from a truck, in the spring of 1951. The O 6600 H was the harbinger of what the Mercedes site calls "a pioneering technical concept" -- forward control with a rear engine. The design allowed for the removal of the long, forward "hood" or "bonnet" and a tremendous reduction of interior noise levels. The 11-meter vehicle employed three headlamps, but no conventional radiator grille. That look was replaced by horizontal slits for air intake. The considerably lower frame made the O6600 H suitable for service in both urban and rural settings (the rural coach featured roof edge glazing.) Outfitted with a transversely installed six-cylinder, OM 315 diesel engine, the bus offered 145 hp with a payload of 6,600 tons and used an electric gearshift. The model was highly successful in Germany as well as around the world in countries like Argentina, where the company delivered 350 of the trolley version of the bus, the Type O 6600 T.
Photo 2. Mercedes-Benz Type O 321 H "Omnibus"
This model was followed in 1954 by the semi-integral O 321 H, produced in Mannheim. Semi- integral means that the body, when mounted on the frame, played a role in supporting the weight of the whole. This design served several key purposes including bringing down the weight, creating a more roomy luggage compartment (thanks to the removal of the side members on the chassis) and achieved a more stable ride with coil springs on the front axle rather than leaf springs. The OM 321 diesel engine remained rear mounted and was offered first as a 110 hp unit and then as an optional 126 hp. Overall the bus was 9.2 meters in length (nine seat rows) with a 10.9 meter version (11 seat rows) offered later. The rounded body and headlamps integrated into the radiator grille made for a pleasing exterior and the grill design continued through the Mercedes-Benz Type O 303. Over the life of the O 321 H, the windscreen's bottom edges were dropped, the top edge raised, and the rear end re-conceptualized with a bigger screen. Like its predecessor, the O 321 H was built for town and country use. In six years, 10,000 were produced with a total of 30,000 O321H/HL units built, making the model the best-selling bus of its day and one of the company's most successful models. In the same period, Mercedes-Benz constructed its only bus with a horizontally mounted middle engine (between the axles under the floor.) This model, the O 317, used a 192 hp, six-cylinder OM 326 diesel engine. The bus measured 12-meters (later 11.3 meters) with a capacity of 120 passengers and featured double-boarding doors and air suspension. The rural-service version was outfitted with luggage compartments. The engine placement allowed conversion firms to easily transform the O 317 into double-deckers, semi-double-deckers, and articulated buses. In 1956 the company also produced its first minibus, the O 319 based on the L 319 van. Space was saved by putting the four-cylinder engine in the front, with the overall vehicle length kept at only 4.8 meters. It was an unusual little gem, but versatile, with a capacity of 10 to 18 passengers. There was a regular-service version and a coach with roof edge glazing. The final production run for the model was more than 15,000 units.